Week One: Miss B's birthday meant cake and a nice dinner. She wanted something international for her main course and a cake that was not too rich or sweet. I made a Massaman curry from My Underground Kitchen, very yummy and not overly hot or spicy. Her birthday cake was a Feijoa Lumberjack cake, a recipe which popped up on facebook helping us to use our excess feijoas. Verdict: Both were absolutely delicious, and I think the curry will be come a regular in my winter comfort food repertoire. Week Two: Friday is normally Feed yourself Friday in my house, however I had not worked that day, and after a yoga session then the rest of the day doing some house work and gardening, I needed sustenance. All I could think about was risotto, luckily my AWW Rice and Risotto book had a nice simple recipe that I had all the ingredients on hand for - Lemon Risotto . I was able to read and sip a chardonnay while continuously stirring. Verdict: I really enjoyed it creamy, cheesy and the lemon juice we drizzled over the top took the richness off it. General consensus was that it tasted like a more deliciously rich macaroni cheese, and I could make it again, just not when Mr J is home. Week Three: Was a write off in the cooking department, I cooked quick tried and tested one pot meals all week, no inclination to try anything new. Week Four: Finding a recipe that used up my limes and the buttermilk sitting in the fridge was a fortuitous find. Lime Syrup Buttermilk Cake from my AWW Cookbook - Classic Cakes is a good fallback for when I need something, and this recipe was nice and easy to make, and the fresh lime scent as I grated zest was a bonus. Verdict: Moist and delicious, especially slightly warm from the oven. Yes I would definitely make this again. Lets see how June goes, and whether I'll be all inspired to be creative in the kitchen after my trip to Australia, I'm hoping to come home with some baking ingredients we can't get in New Zealand. I couldn't resist, I had to make an Ice Cream Soda EPP block. I reckon choosing fabrics is going to be pretty hard for each block, but I am really happy with how this one has turned out. As you may have guessed - I'm going scrappy, I have also sorted all the pieces required for a block and punched holes in them for easy removal when required. Currently I'm hand basting them, I'm tempted to try basting glue, but am paranoid about it sticking and ruining the blocks. I'm not doing any more for now, but will get fabrics cut for a couple of blocks to sew while waiting in airports or on the plane next month. My yoga instructor must have a pretty productive lime tree, lately, there is always a basket of them for us to take a couple home when we leave class. I thought I should use them this weekend. The scent was amazing as I was grating the zest for a Lime Syrup Buttermilk Cake. Details on Cook the Books next week. My manuka trees are just covered in flowers now - I love how one plant can have so many different shades of pink on it. Remember that epic EPP project I was contemplating starting? Well in a fit of madness, I signed up for Jodi at Tales of Cloth, Ice Cream Soda Club. Each month we are sent the papers to complete eight blocks, which in theory should be manageable. Today my first batch of paper pieces arrived, I have to admit, I got a bit of a shock when I looked at them and saw how tiny those centre diamonds are. We'll see how I go, I imagine mine will take a little longer cos of other projects I am working on too. My big dilemma now is what fabrics to use. Should I make it solely from my stash of Denyse Schmidt or Anna Maria Horner fabrics, some of which are pictured above, or should I go totally scrappy. The blocks definitely look better with fussy cuts, so I need to get my head around the wastage that creates too. Best I don't waste too much time thinking about it or the next lot of papers will arrive before I've started this lot. To check out some of the fabulous fussy cutting and amazing blocks, pop over here. Is any one else doing the Ice Cream Soda Club? 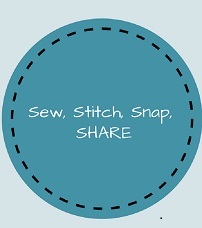 Welcome to Sew, Stitch, Snap, Share. Linda and I are loving seeing what you are all creating or working on. There are some amazing WIPs and finishes. We have had a couple of comments from people saying they prefer link ups with more detail, IE: photos, link titles, blog names. We have to admit, we like these link ups too, however it costs to add that option to a linky, (not a lot) but it's a cost that Linda and I would incur, so that is why we aren't using it at this point. We hope that won't stop you from joining us each fortnight and popping over to see some of the other bloggers who have joined us also. There hasn't been a lot of sewing from me lately, still working on the hand quilting on my Liberty Bloomsbury but there are only so many photos of purple stitches on fabric I can show. I have however started working on another border for my medallion quilt and have made some little paper pieced tulips blocks for it. The colours are more in keeping with the theme of the quilt this time. A colourful view of my tropical cannas, still bravely flowering despite all the wild wind and rain. Slow progress on another bird for my bird dance project. A tiny EPP Liberty Dresden, has been turned into a label for the Liberty Bloomsbury, hand quilting is progressing well, though I have been finding I am getting sore shoulders from doing it. All going well, this quilt should be finished by the end of May. I love the vibrant green a leek turns as it it gently cooks. 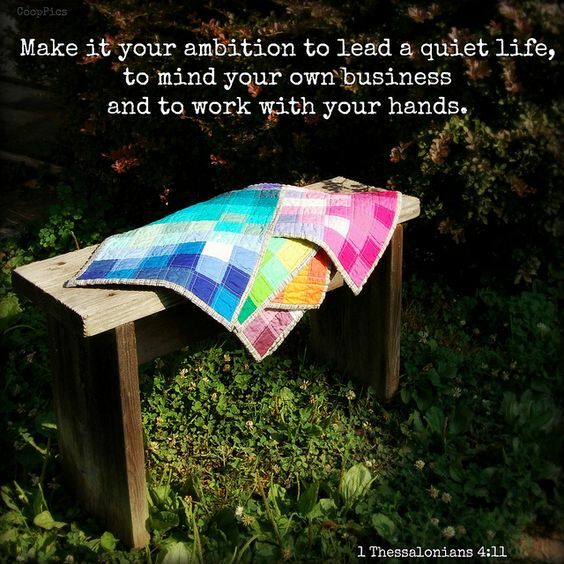 I'm not normally one for putting bible verses on my blog, but I came across this one in a book the other day and it resonated with me, which then led to me finding this blog post . Suddenly it doesn't feel wrong to not want to be a super achiever or splash my complete life story over the internet. My garden constantly surprises me, I always forget about these plants until they start flowering or change leaf colour in the cooler and slightly damper autumnal weather. Even though the mornings and evenings are getting a little chillier, we are still enjoying mild Autumn temperatures. Making // Some more felt birds for my Bird Dance project. Dreaming // Of a clean and tidy sewing room - I must vacuum it and sort out felt and fabric this weekend!! Linking up to Here & Now at Say Little Hen. Now that we are experiencing the slightly cooler temperatures of Autumn, the Liberty Bloomsbury has been pulled out again and the hand quilting has re-commenced. There is something about snuggling under a quilt as you are working on it. It does take a little longer to do some times, thanks to my helper, who thinks the needle and thread are great toys. I'll be having to lock myself away to quilt soon. I have three more Dresden blocks to hand quilt and am contemplating whether to hand quilt the Liberty borders too, nothing like making more work for myself. I can't wait to have this quilt on my bed, but I think it will have to be when Meeka is a little older and doesn't attack toes and knees through the bed clothes (of course, I could just shut the bedroom door at night). Signs of Autumn - fungi, autumn leaves and seed pods. Feijoas galore - my two trees have given us their first two fruit. Luckily, friends have given us lots more. A fabulous reading pile - just a slight theme happening. I've started the odd one out, The Three Miss Allens, which is set in modern day Australia, with flashbacks to the past. More sewing on the medallion quilt: fussy cut corner stones - I like how they echo the centre block pattern, and I repeated the first border, which seems to have toned down the rainbow squares, so I am feeling much happier about this quilt in progress now. I think this will be a big quilt, it is currently measuring 48" square. New plantings - in the vege garden there is beetroot, perpetual spinach and I'm trying some lettuce for winter. In the flower garden, (with help from Meeka), the Iceland poppy plants and sweet pea seeds have gone in too. Looking forward to being able to pick lots of flowers. I have been focusing more on the stitch part of my WIPs, rather than the sew. I have now completed 20 birds from my Bird Dance project, so officially 2/3 done. This deep violet bird would be one of my favourites. I have found that I tend to name the birds as I have been making them, (is that weird) I am thinking when I eventually finish this project , I will have to print a little name guide to put on the back with their original numbers. Ten birds left to make in just under two months - will I get them done? ?